HIGHLANDS  The community is preparing for its annual rite – the Highlands Jamboree, now in its 56th year, according to Jamboree organizers Jessica Woods and various chairpersons from the Chamber of Commerce. The celebration of Highlands birth will take place on October 6th, with its numerous events held at various venues around the town. Also planned for the following weekend is the Miss Highlands and Jr. Miss Highlands pageants, according to chairpersons Chrissa Cotten and Delene Cotten. The pageant contestants, all 26 of them, will participate in the Jamboree parade on the 6th, and then hold the competition for titles on Saturday, Oct. 13th, a week later. The Jr. Miss Pageant starts at 2 p.m. in the Highlands Junior School auditorium. The Miss Highlands Pageant will be held starting at 7 p.m. also at the school. Emcee for both pageants is Jeff Moore, managing partner of Sterling-White. The public is invited and welcome to attend these competitions and events. The Jamboree starts on Saturday morning, Oct. 6 at 7 a.m. with a 5K Fun-Run/Walk starting at the Community Center in Highland Woods. 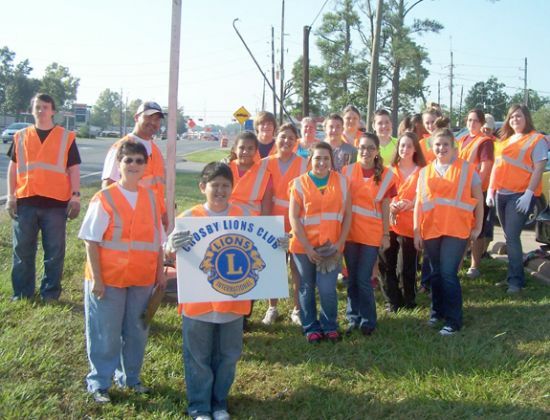 Proceeds from this run benefit Habitat for Humanity in Baytown. Next is the parade, travelling south down main street from E. Houston Street to Jones Road. Floats will demonstrate this years theme, Peace, Love, and Highlands! Six awards will be given out, in various categories. The Line-up starts at 9 a.m. at Hopper Primary School, the parade starts at 10 a.m.
After the parade ends, attention of the community will turn to the exhibits and activities at the Highlands Elementary School on Wallisville Road. Here will be public safety exhibits, crafts and food booths, the Little Miss/Mister Pageant, the Car Show, a silent auction, door prizes, and entertainment on the stage. The Car Show will feature antique and recent cars of all types. As Dickie Woods, chairperson, says If youre proud of it… Show it off. Awards will be given in a number of categories, including Chamber Choice, Peoples Choice, Participants Choice, Best of Show. Proceeds will benefit the Highlands Heritage Museum and Preservation Project, which is planning a museum in the Chamber office building, and a restoration and exhibition of the old railcar that ran through Highlands from Houston to Baytown. Entry fee is $25, and includes lunch. There will also be cash prizes. Last year about 35 cars, trucks and other vehicles participated. Touring in the earlier parade is optional but encouraged. The Little Miss/Mister pageant is for children up to 11 years old, or 5th grade. Awards are given in seven age categories. Entry fee is $35, and proceeds go to the scholarship fund and Partners in Education. Chairperson is Kristy Stallings. Many persons are involved in helping this event. A few include Reba Rachal, Betty Brewer, Sheila McDonald, Betty Michalsky, Jessica Woods, Dickie Woods, Tonya Russell, Phillip Morris, and many more. CHANNELVIEW  A couple had only begun to gas up their newly obtained vehicle when it reported back to its owner. The owner of 10 Acres Auto on U.S 90 called deputies concerning his vehicle stolen from his lot and that he had just installed with Lo-Jack, the security recovery system. He gave deputies the location of the vehicle. Pct. 3 Deputies rolled to Dell Dale and South Brentwood in Channelview. A male driver and a female passenger were within the car being filled with gasoline. Deputies removed the suspects from the car and conducted an inventory of items prior to the vehicle being towed. Deputies then found numerous identifications from many individuals throughout northeast Harris County. They found a variety of drivers licences, identification cards, a couple of passports and check books from numerous other people, some from east of Lake Houston. They found checks made out to the North Shore Rotary from various people. Coincidentally, the treasurer of North Shore Rotary had reported checks stolen from his vehicle. The district attorney took charges against Jason Dinroe 31, and Amber Richards, 27. Deputies then were able to find where the two were residing, at a nearby motel. They went to the Shady Glen Motel and obtained a consent to search the building and found (among other items) a loaded shotgun, a pistol hidden under their pillow. Numerous checks were found, numerous tools called by law enforcement burglary tools were also found. At that location, Dinroes normally used vehicle, a truck was loaded with items that appear to have been taken during burglaries. Deputies recovered a computer, jewelry aand some cash at the Shady Glen. Captain Moore said that Dinroe had been to prison three times on burglaries and thefts. As deputies reviewed the video from the car lot, they noted that another truck dropped Dinroe off at High 10 Autos and the burglary followed. But the truck that dropped him off had license plates that was exactly like a Ford F-150 that had been stolen the day before at about 1:00 p.m.
During the investigation deputies were able to ascertain the location of that F-150. Deputies also determined that the couple was associated with a storage facility near where they were arrested. Surveillance of that storage facility that the couple was using lead to other arrests. Dinroe as not personally renting that storage facility but had access to it. Deputies put five other suspects in jail related to the storage facility. A total of 13 suspects were detained related to the surveillance and investigation. CROSBY  In two closed door meetings last Monday night, that lasted from 6:45 until 11:00 p.m. there was talk by Crosby ISD Board of Trustees of forming a committee to look at the needs of the school district and determine, as the Board has, that there is a need for a new high school that is to cost about $75 M.
The board discussed the parameters for a potential building program and getting together a Citizens Advisory Committee to begin the process of reviewing where the district is and how many students the district needs to prepare for to meet future needs. It was a night in which there was public and closed session deliberation about real property and the board hired Fred and Jarrod Fargo, appraisers with over 50 years experience, to represent the district investigating land for acquisition. Then they brought the pair into closed session to discuss something about property. Now 1,463 students are in Crosby High School with a capacity of about 1,800. The new High School would need to handle about 2,800 . There will be elections conjoint with Harris County for Crosby ISD School Board of Trustees on November 6. Also of note, of the candidates to be on the Crosby ISD Board of Trustees, only board of trustee members attended the meeting. No candidate showed up for the meeting that was not already on the board with one meeting left before the election. Discussion lasted several minutes on how to replace the 30 year old high school that was renovated first in 2004 to add 28,500 square feet for science and extra class size on the East side plus 9,653 square feet of library for about $10M. Also not discussed was that 30 years is very old for a Texas high school building but 100 years is not old at all for schools in America that send up to 80% of their high school graduates to Ivy League Universities. Perchance the building isnt teaching. Jerry Bevill of CRE8 architects advised the board that if anyone decided that a new Middle School was the way to go then the extant high school would still need a number of changes as well. The board asked how much taxes would have to go up if a new $75M. high school was built and a review to determine that amount would have to be done by the Superintendents office. One off the cuff estimate was 12¢ per $100 valuation. The board approved another Pre-School Program for Children with Disabilities at the kindergarten. 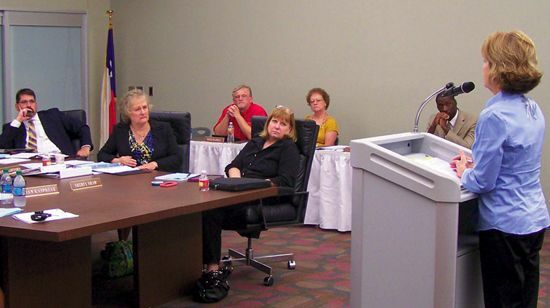 A Special Education Lifeskills Unit was approved for Crosby Middle School was approved. All of these discussions were atop the on-going dispute with JoAnne Crawford over the budget. There seems to be an ongoing argument between most of the board that sees the budget as a framework for expenditures to be managed and a requirement that all matters be resolved for expenditures in advance. Wherein the public discovered that $60,000 per year goes to Goose Creek Consolidated ISD to collect Crosby Taxes instead of the Crosby Tax Office at about $140,000. The resolution approving the 2012 Crosby ISD Property Tax Roll passed 5-1 with JoAnne Crawford the negative. The approval of a resolution adopting an ordinance fixing and levying school district ad valorem taxes for the fiscal year 2112-2013 was voted 5-1 with Crawford being the only negative again. All foreclosures were approved unanimously. Mr. Davis was called to the podium to testify about the state of student to teacher ratio which is now about 20 to one for most of the school but 25 to one for much of the fifth grade. The board devoted some time to discussing how to equalize classes for both Drew Intermediate and Crosby Elementary School. Assistant Superintendent Patricia Kay addressed the board concerning all matters of Curriculum including Handwriting/Cursive taught in the 3rd through 6th grade unless the student opts for manuscript in the 4th grade. Much ado about Summer School, seriously about 1:45 hours, teachers were very proud of accomplishments of the 180 students in the Pre-K through 6th grade and the 206 that attended for the 7th through 12th grade. There was a detailed explanation of B.Y.O.B. (Bring your own books) and the Netbooks program for much of the middle school. 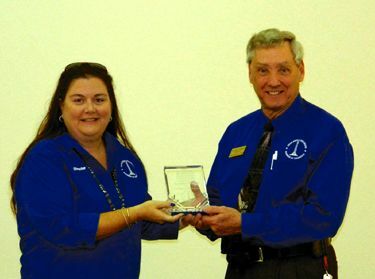 HIGHLANDS  The Chamber of Commerce held their annual Community Awards luncheon last Thursday, noting service by public servants to the good of the community. They also welcomed new members, Albert Luna, Judy Culbreath of CommunityBank Texas, and Brandon Baird of Woodforest Bank. The top award went to Pastor Phillip Morris for his service to the community. In making the presentation, last years winner Jessica Woods noted Morris service as pastor of Restoration House Church, chair of the Highlands Ministerial association, president of the chamber for two years, counselor and teacher in family matters, and other avenues of service. Morris accepted with a humble talk about his life, and how his faith had helped him overcome many problems in his early life. He also credited his wives and church members. The Chamber also awarded firefighter, constable, sheriffs deputy, and business awards. 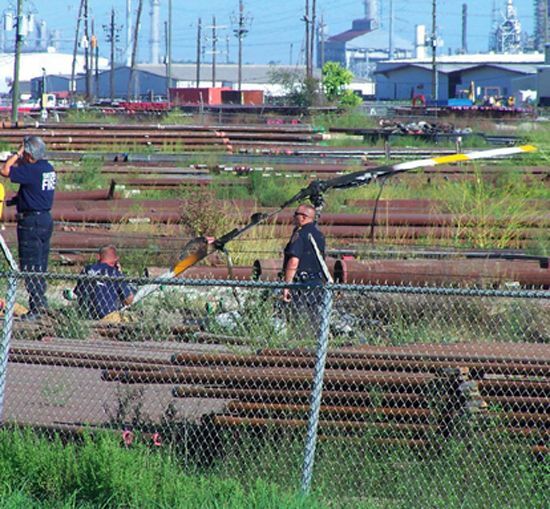 EAST HOUSTON  Rescue efforts by local men at about 3:40 p.m. on Monday were unable to save the lives of two people in a helicopter that crashed in the industrial pipeyard cornering Miller Road #3 and the Crosby Freeway. State Troopers indicate it was a Robinson R-22 Helicopter with a man and woman on board. Witnesses say they saw it begin to tailspin horizontally then fall straight down and hit the ground inside the fence a few feet from the U.S. 90 access road on the afternoon of Sept. 10. The victims have been identified by the Department of Public Safety as Christopher John Yeager, 40, the pilot of Houston and Joyce Ann Ates, 60, a photographer from Midwest City, Oklahoma. The National Transportation and Safety Board (NTSB) examined the scene and the location was secured by State Law Enforcement troopers including Highway Patrol and the Harris County Sheriffs Department was present. The NTSB spokesperson Tom Latson indicated they were still seeking facts in the case and that the NTSB wanted to talk to anyone that saw the helicopter crash. Latson indicated the craft was operated by Helicopter Services Incorporated out of Hooks Airport in Spring. The Department of Public Safety indicates the craft had refuelled in Baytown about 1:30 p.m. The Federal Aviation Administration has joined the investigation. CROSBY  A man drowned in the San Jacinto River last Friday evening, August 31, about 6:30 p.m. He was reportedly swimming with friends near Gulf Pump Road, according to Sheriffs deputies. When the swimmer went under water near the middle of the river, his friends searched for him for about 15 minutes with no results, and then they called 911 for help. The Marine Unit of the Harris County Sheriffs office searched the scene, and found the body of the man about 8:00 p.m. near the bridge over the Old Beaumont highway. The swimmer has been identified as Jorge Ramirez, age 23. An autopsy will be performed because of the circumstances of the death, authorities said. HARRIS COUNTY  Burglary is a serious threat to everyone living here with reports that nearly one quarter of a million have been reported in this county over the past six years. The Highlands, Crosby and Huffman areas are seeing a renewed effort on the part of thieves to hit anyone for objects that can be converted into cash as fast as can be done. An incident on Wallisville Road near the new school when a citizen reported a copper wire theft in progress says that the utility was out replacing copper wire for the third time that day in Highlands. A new scene in Crosby are young people out walking the street in the wee hours of the morning asking for loans, lifts, or help- looking like they need a fix or are walking off some kind of stimmulation. Newly becoming frequent are distraction burglaries, these generally target the elderly in subdivisions like Indian Shores August 29 and the week before that out east in the Bohemian Hall area. Neighbors have reported the same kind of crime about trees overgrown the roadway and working out deals to have them cleared all the while a thief is cleaning out the older citizens closets. The common element of both are that someone cames to the front door and while the homeowner was distracted, the theft occurred. Even though the Harris County Sheriffs Office saw a 7% decrease in unincorporated Harris County last year, areas tend to catch up fast. It takes a car burglar not even a whole day to jack over 100 cars or trucks. These serial burglars are statistical nightmares for law enforcement. 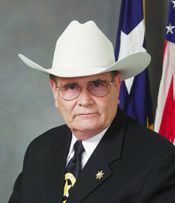 Precinct 3 Constable Ken Jones has been looking into and effecting arrests even though his operation is reduced 14 people from last year by budget cut backs. Statistically one can only hope to interdict a few burglars reacting to alarms and reports, tactical crews armed with information, that do surveillance and track multiple offenders as the enter and exit jails are more expensive but effective. Jones task force using officers that normally work for schools included deploying the anti-burglar unit as patrol units, undercover officers, sweeps to arrest offenders on outstanding warrants, as well as old fashioned detective work. Lt. Jeff Stauber, who heads the burglary division for Harris County Sheriffs Office, said deputies have been successful in collecting DNA from burglary scenes. Since the project began in 2009, 792 DNA samples sent to the Harris County Institute of Forensic Sciences have resulted in 253 charges filed. When DNA comes in, it (burglary) may not be solved for another year, but sometimes we get lucky and get a hit right away, Stauber said. Significantly, some serial burglaries in the Newport Subdivision have been solved by suspects cutting themselves entering homes. The residual blood lead in two cases of repeat offendars being prosecuted again. Still of late, some officers say the Sheriff is frustraited with the efficiency of the office in our area. Other residents say it has become evident that Sheriffs Deputies do not respond to reports of burglary as they once did. Other residents are reporting that crimes that require more time to commit like stealing tailgates and locked tool trailers is increasingly being reported. Last year the legislature reviewed increasing the punitive charges to those caught performing burglaries and the House Judicial Committee found that Texas was among the most heavy handed states with regard to burglary but had the least decrease three Summers ago.